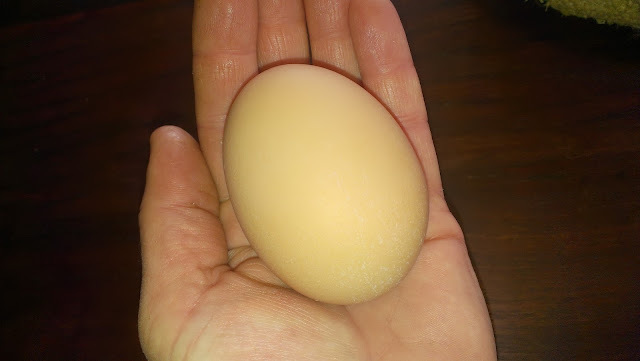 This morning, one of the Chooky girls laid an enormous egg. It weighed in at a massive 100gms. I zeroed the scale for the cup measure. Weighing this one made me want to compare its weight to others recently gathered. 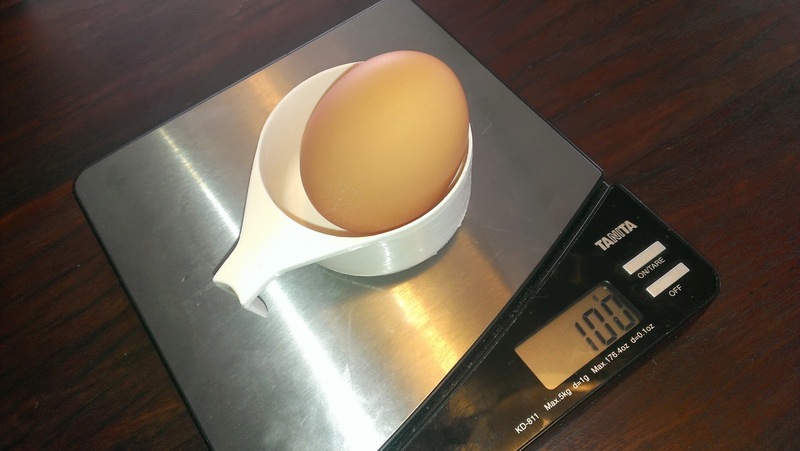 The previous largest egg weighed in at 75g. 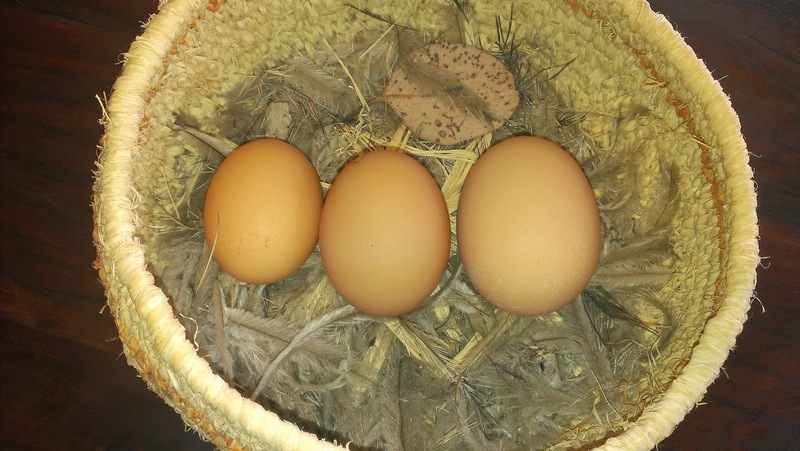 The 100g egg is pictured here with a 75g and a 57g to show the difference. This massive egg looks to be the odd egg out in the egg storage section of the fridge. I suspect it is sitting higher in the egg carton than the others. I wonder if it is a double-yolker or if the shell is extra thick? 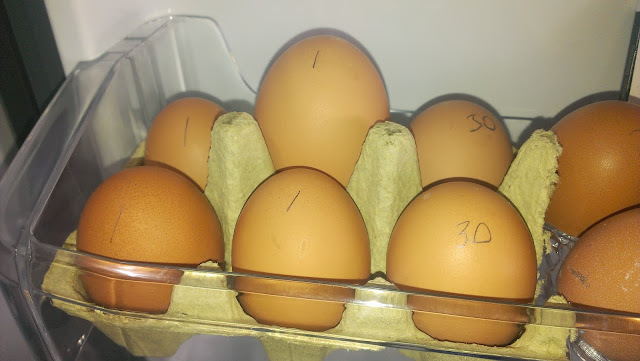 The numbers on the eggs are the date they were laid - do you mark your eggs like this? That is a whopper! I haven't had one quite so big but they have slowly increased in size over the last 18 months. Have you had a shell-less egg, yet? I got one when they were being broody. The membrane and the yolk and white were there, but no shell. I write on my eggs too, like this: 1/7. Apart from now, when they are on strike, I usually have two cartons on the go in the fridge and move the eggs along as older ones are being used up. Yes, we have had one shell -less egg. Just one so far and strangely laid away from the normal laying space, as if they knew that it wasn't a proper egg. What a corker! I like your egg marking strategy - I think I will adopt it. Cheers! I too will adopt your egg marking technique. My mum gets me eggs at her food swap sometimes and they always have helpful pencilled dates on them too. That's a fab name for a chook!